Immunocytochemistry/Immunofluorescence: Adenosine A2a R Antibody (7F6-G5-A2) [NBP1-39474] - Neuro2a cells were fixed for 10 minutes using 10% formalin and then permeabilized for 5 minutes using 1X TBS + 0.5% Triton-X100. The cells were incubated with anti-Adenosine A2a R (7F6-G5-A2), NBP1-39474, at a 1:50 dilution overnight at 4C and detected with an anti-mouse Dylight 488 (Green) at a 1:500 dilution. Actin was detected with Phalloidin 568 (Red) at a 1:200 dilution. Nuclei were counterstained with DAPI (Blue). Cells were imaged using a 40X objective. 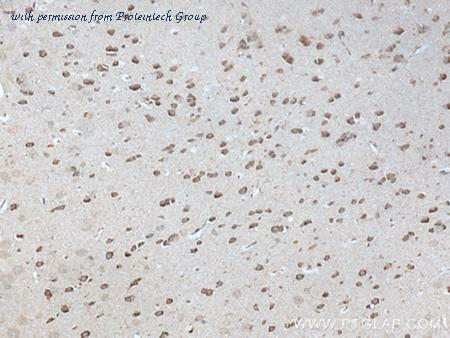 Immunohistochemistry-Paraffin: Adenosine A2a R Antibody (7F6-G5-A2) [NBP1-39474] - IHC analysis of a formalin fixed paraffin embedded tissue section of mouse brain using Adenosine A2a R antibody (clone 7F6-G5-A2) at 1:100 dilution. 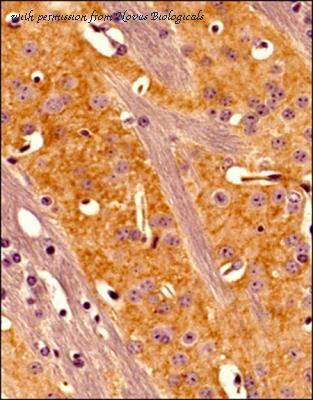 The The antibody generated nice membranous / punctate staining of Adenosine A2a receptors. Immunocytochemistry/Immunofluorescence: Adenosine A2a R Antibody (7F6-G5-A2) [NBP1-39474] - HeLa cells were fixed for 10 minutes using 10% formalin and then permeabilized for 5 minutes using 1X TBS + 0.5% Triton-X100. The cells were incubated with anti-Adenosine A2a R (7F6-G5-A2), NBP1-39474, at a 1:50 dilution overnight at 4C and detected with an anti-mouse Dylight 488 (Green) at a 1:500 dilution. Actin was detected with Phalloidin 568 (Red) at a 1:200 dilution. Nuclei were counterstained with DAPI (Blue). Cells were imaged using a 40X objective. Western Blot: Adenosine A2a R Antibody [NB300-597] - Analysis of 25 ug of human placenta (lane 1), HepG2 (lane 2), Hela (lane 3) and mouse liver (lane 4) cell lysates. 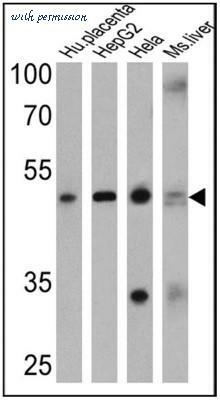 The ADORA2A antibody from Proteintech is a rabbit polyclonal antibody to a recombinant protein of human ADORA2A. This antibody recognizes human,mouse,rat antigen. 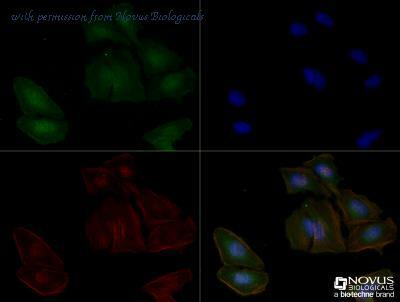 The ADORA2A antibody has been validated for the following applications: ELISA, IHC analysis.